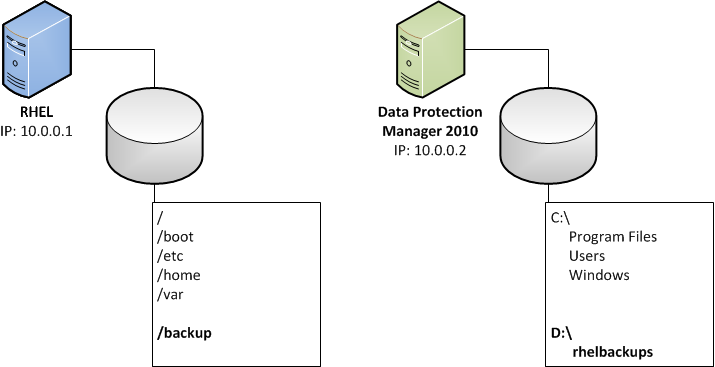 Today we transitioned from Microsoft DPM 2010 to Microsoft DPM 2012. It was no problem as the structure remained the same - backing up the copied files off our linux clients from the windows host NFS volume. We put our heads together and came up with a cheaper alternative that required some initial labor and ongoing overhead to verify backups. We ended up with some overelaborate scripts to suite our taste, but I’ve oversimplified it for easy reading. 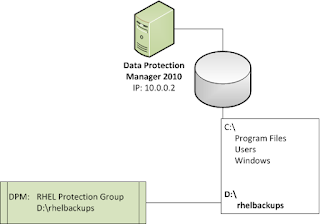 First, we carved out some backup storage space on both the Red Hat server for the initial local backups and on the Data Protection Manager’s server for an NFS mirror. 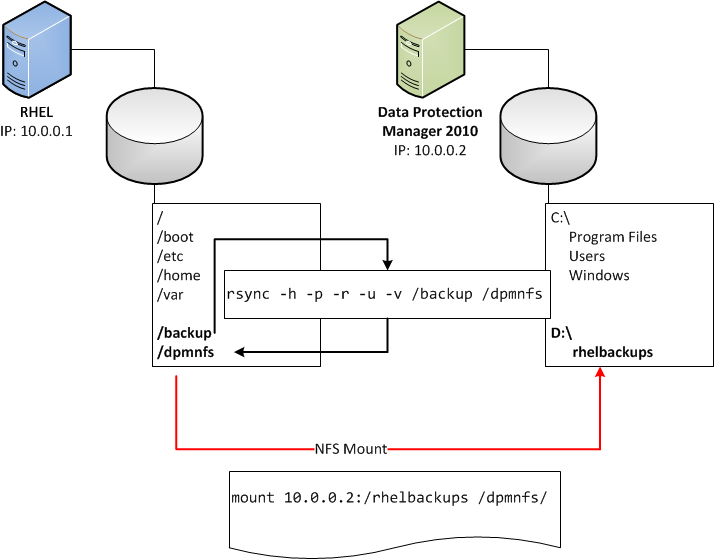 Second, we added an NFS root on the Data Protection Manager’s server with the NFS mapping to a mount on the Red Hat server. Third, a bash script creates tar files on the Red Hat server that is activated via a daily cron. 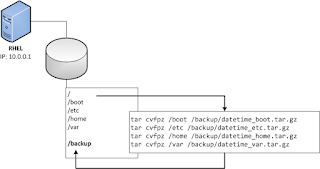 Once the tar files are created, we use the RSYNC to mirror the local storage backups from the Red Hat server to the Data Protection Manager’s storage via the NFS mount folder. 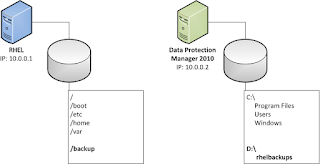 Forth, the Data Protection Manager Server NFS Root is added to a D.P.M. Protection Group. Lastly, we added scripts on both systems that pruned files based on our retention requirements and added log file outputs for verification and diagnostics. It was a bit of an exercise to get this configured and learn the technologies, but I think it was well worth the learning experience to challenge ourselves, fight limitations, and save some hard costs of equipment with soft costs of labor. Nice article. 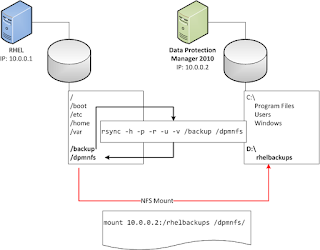 What are your thoughts on using a Windows CIFs share on the DPM server and then getting the Linux servers to backup to those shares rather than an NFS? As long as you can see the files in the CIF share from DPM's console, it should allow you to back them up. Six of one and half a dozen of the other. 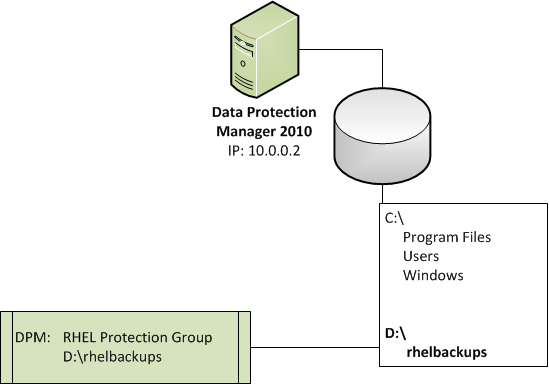 How does the DPM "know" that the RH backup is finished and DPM can start backing up the files ? The bash and perl scripts are more involved than I show. They log and send out success / failure alerts. DPM does not directly know when there's an issue, but we do. Rocking guide bro! I have to come up with a way to do Azure cloud to cloud file level and bare metal backup for Windows servers and file level backup for Linux servers and this should do for now. I am looking at some turn key stuff but this is essentially free for us and covers the nut.